The official start of summer will be here in a few short weeks, however, the hot, humid weather is already setting in here in Piedmont. With the start of the summer season comes an increase in pest activity. 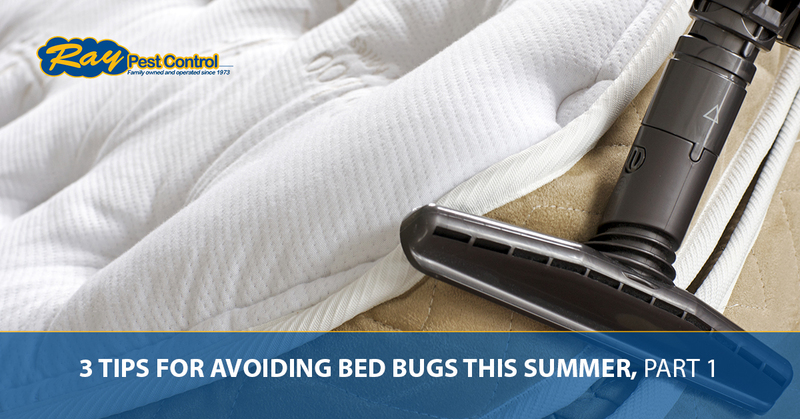 While bed bugs never really take time off from invading people’s homes, they do become more active during summertime. Why is this? With the increase in travel to and from Piedmont means that these hitchhiking menaces have a greater chance of moving from dwelling-to-dwelling, which means they could be coming to a bed near you. While bed bugs don’t pose any significant health threats to humans and animals like some of our other blood-sucking pests, they invade the sacred spaces in your home, bite, and can make a mess of your sheets and upholstered furniture, not to mention the psychological stress these tiny terrors can cause. As your friendly, Top Rated Local® bed bug removal team in Piedmont, Ray Pest Control will always be there to turn your bed bugs into dead bugs should you experience a bed bug infestation. Below are some tips for you to consider to protect your home, your loved ones, and your property from bed bugs this summer. Summertime is the season of garage and yard sales. Many people take advantage of the nice weather to clean out their homes of unused goods that may be someone else’s treasures. Sometimes, people who have suffered a bed bug infestation will get rid of their furnishings by selling them to someone else. Because you never truly know why a person is selling their old furniture, or setting it out on the curb for free, for that matter, it’s best to use extreme caution with used furniture. One of the easiest ways for bed bugs to spread is when people are traveling. Afterall, they aren’t called the hitchhiking bug for nothing. When staying in a hotel or motel, it is always good to check the room and upholstered furnishings before bringing in your luggage. Check the bedding, upholstered furniture, dresser drawers, and closets. Be on the lookout for signs of bed bugs such as blackish-brown spots on bedding, cast shells, and flat, reddish-brown bugs about the size of an apple seed. Even if the place passes a visual inspection, keep in mind these pests are more active at night, and can easily sneak into your clothing and other personal belongings. For this reason, avoid storing your luggage on the floor, and do not keep your clothing in drawers during your stay. Because you can never be too cautious when it comes to these sneaky pests, it is always smart to schedule a bed bug inspection at the start of summer. Our bed bug experts can quickly identify a bed bug infestation and safely remove them from your home or property with either chemical or non-chemical remediation. If you suspect you have bed bugs, call Ray Pest Control to request a free quote for a bed bug removal in Piedmont. We’ll get rid of your bed bugs for good and if we can’t, we won’t take your money. Join us next time for part two to learn more ways you can protect yourself against bed bugs this summer. Until then, thanks for reading!